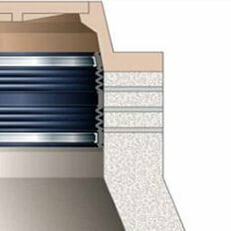 The FlexRib Manhole Frame – Chimney Seal eliminates infiltration and wet weather inflow by creating a watertight seal between the frame casting and the top of the manhole cone. The grade adjustment area of the manhole has been proven to be the single largest source of infiltration and inflow in the collection system. This area of the manhole is the first part of the structure to suffer from deterioration caused by freeze/thaw cycles, traffic loading, thermal expansion and contraction of the surrounding pavement and other external forces. Patented Waveband creates the most effective seal available by concentrating the compressive force of the expansion band. The rubber is captured between the band and the concrete or casting. The FlexRib is extruded from a premium quality rubber compound and the stainless steel wavebands are designed to perform in the corrosive environment of the sanitary sewer.